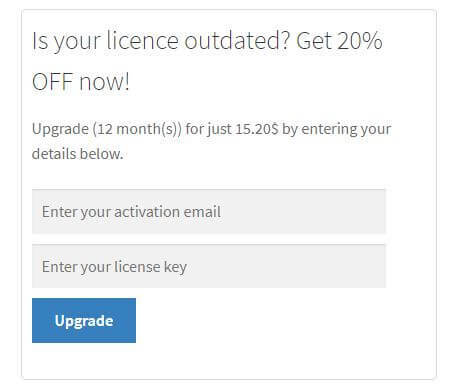 You have purchased a license with expiration date, and it has outdated or is about to. 1. Go to our shop, on the product page. 2a. If the license is NOT outdated, it will be extended by the period starting at the expiration date. 2b. If the license IS outdated, it will be extended by the period starting at purchase date. 3. Fill in your licensing details (for the license you want to renew) in the “Is your license outdated” box. Click “Upgrade”. 4. A renewal item (including Discount, if applicable) is now in your cart. Proceed to checkout. 5. Upon payment, the license will be extended automatically. 6. There’s nothing else to do, the software will handle it.